Many users claim that still has not walked away from the “Vkontakte” only because of the possibility to listen to music. Now you can drop this argument, since the streaming music service is now available in Facebook. Of course, it sold itself is not a social network – extension MuzekBox created the Ukrainian developers of the company StepInMobile. The extension is available for Chrome and Opera stable versions, Firefox, Safari and Internet Explorer in an unstable beta. 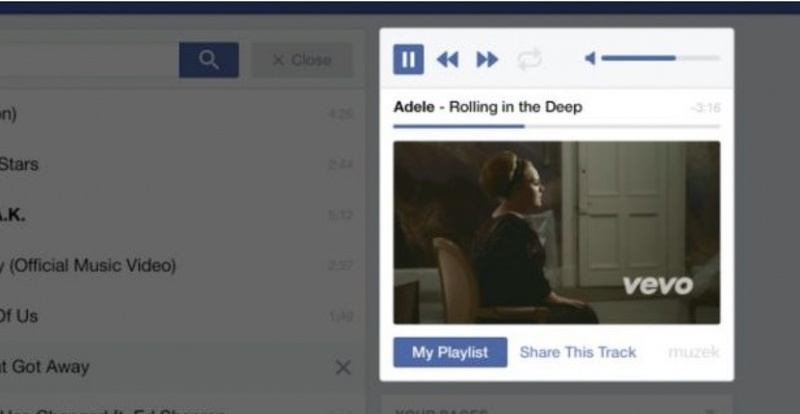 After installing it in the Facebook interface will appear the controls of the music player. He will be able to search music in the search bar Facebook, add it to your playlist and share with friends. If you want, you can import a ready-made playlist of “Vkontakte”, but you need to give the plugin access to your account on the Russian social network. It is noteworthy that the service plays music from YouTube, thus, in fact, the user listens to clips of the artists. Side player you can see a small window with the video. Obviously, therefore, the developers overcame a severe limitation on pirated content on Facebook.